We often get asked about our Lifetime Mold Guarantee. What is it? How does it work? Xcentric offers a Lifetime Mold Guarantee at no extra cost to you for the life of your project. We stand behind every mold we build and run. No Part Quantity Limits – There are no part quantity limits for the life of your project. High Quality Mold Components – We are committed to providing you with only the highest quality mold components. Proactive Mold Maintenance – With our U.S. based tool room, we proactively maintain your mold. Each mold is serviced each time prior to and after running a project; saving you time and money. All Parts Are Run on Electric Mold Machines – Our all-electric machines have the benefit of running at a higher speed and are more efficient throughout the entire production process. Independent motors and sensors control the process and prevent damage to the mold. Our Propriety Process Engine is utilized to prevent part overshot and applying too much pressure in the cavity which can potentially break mold features. 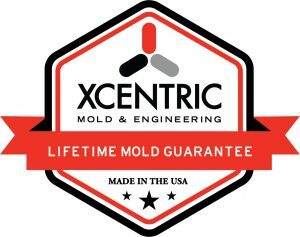 For additional information regarding our Lifetime Mold Guarantee, contact one of our Technical Specialists today at 586-598-4636 or sales@xcentricmold.com.